As well as cementing his name as one of the great metal guitarists of all time during his all-too-brief stint with Ozzy Osbourne, Randy Rhoads propelled Jackson guitars into the mainstream. Back in 1978, luthier Grover Jackson had just bought the Charvel brand when Randy requested a new V-style axe. Jackson´s resultant instrument - produced with Charvel´s Tim Wilson and Mike Shannon - was an asymmetrical V shape with a maple neck-through-body design, ebony fretboard, Strat-style vibrato and Seymour Duncan humbuckers. Rhoads dubbed it the Concorde, and it became the first guitar to bear Jackson´s name, thus launching the brand. 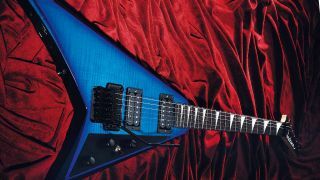 Jackson made several revisions to the original Randy Rhoads design before its release, most notably extending the guitar´s upper horn to differentiate it from the Flying V, but tragically, Randy was killed in a plane crash before the guitar was put into production. The model has lived on in various guises, including the space-age Roswell Rhoads, with just about every big name in metal wielding one at some point - and, thanks to Randy, the same can be said for Grover Jackson´s guitars in general.